Spain's Crisis Leads To Rise Of Grass-Roots Groups The country's protest movement has evolved into a broad range of groups now filling the gaps left by the eroding welfare state. From doctors to teachers and homeowners to judges, Spaniards are organizing. 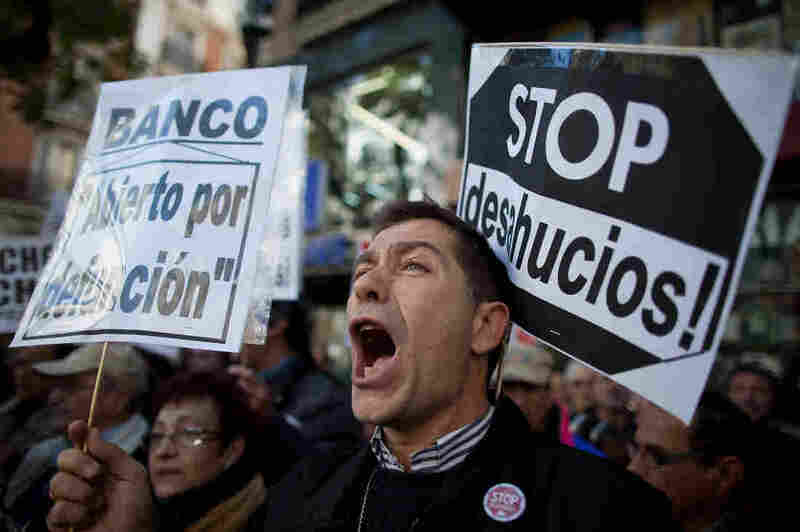 A year and a half ago, recession-ravaged Spanish society reacted to the economic crisis with the "Indignados," a mass protest that inspired the worldwide "Occupy" movement. The "angry ones" are long gone from Spanish streets, but they've evolved into many grass-roots associations now filling the gaps left by the eroding welfare state, spawning a new form of anti-austerity resistance that embraces all branches of society, from those who have lost homes to foreclosures, to the entire judiciary. Hardly a day passes in Spain without a noisy demonstration by one sector of society or another. One day, it's doctors. With drums beating, thousands of white-clad health workers protest government plans to overhaul the country's highly respected public health system. "What they want to do is privatize the hospital, and we are here to just say we don't want that to happen. We want that to stop because we think it has to be universal; everybody has to be able to go to hospital," says Olwen Leaman, a young oncologist at Madrid's Princesa hospital. 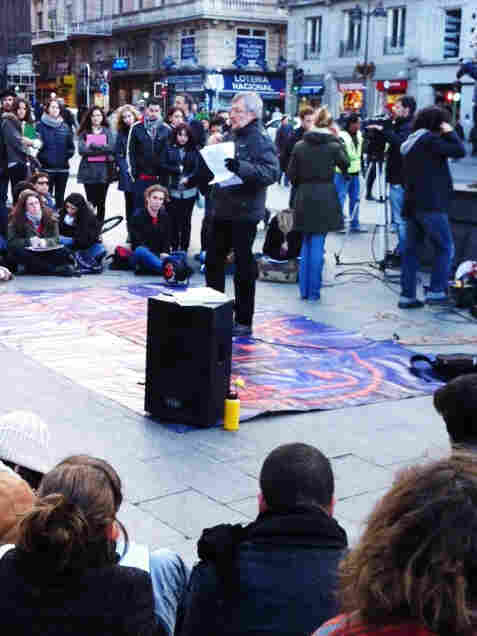 Last week in Madrid's Puerta Del Sol square, a professor teaches a lesson outdoors while students take notes, all as a means of protesting education cuts. The next day, it's university professors and students. In a central square in the nation's capital, a political science professor lectures on Hobbes and the nature of power to note-taking students sitting on the pavement. Holding a class outdoors in frosty weather is a way to protest the billions of dollars in public education cutbacks, from nursery school to university. In Madrid alone, more than 250 professors have been sacked. One of the students attending the outdoor class, Arturo Samis, 19, says the government wants to privatize everything. "They are trying to steal our education," Samis says. "Now it is getting so expensive we cannot afford it. In some years maybe there won't be any public education in Spain. This is in the long term a shout that we need help to keep on studying." Violetta Assiego, an analyst at Metroscopia, a public opinion institute, says the new activism cuts across ideological lines and takes place outside traditional trade unions and political parties. The spark of the new social mobilization was the Indignados movement that for months last year occupied Spanish squares. "The Indignados gave birth to a myriad number of citizens' groups that are channeling much of the protest and people's sense of desperation," says Assiego. "Without these groups, there would have been a social explosion." In an unprecedented action, we've all joined together — judges, prosecutors, lawyers and clerks, from left to right. We feel this incompetent political establishment is trying to dismantle the basic pillars of Spanish society — health, education and justice. One group was created in response to the wave of evictions triggered by Spain's massive real estate bubble. Some groups acted as human shields trying to prevent officials from reaching foreclosed homes. This summer, a group of activists prevented police agents from trying to enter a ­building, shouting, "This apartment will not surrender." In Spain's capital alone, the movement has successfully blocked 500 evictions, according to the head of Madrid's anti-eviction movement, Cristina Escribano. In the capital, officials say the total number of eviction orders is 8,000. Nationwide, there have been a total of 350,000 eviction orders. The anti-eviction movement gained further momentum after three people waiting to be kicked out of their homes killed themselves. The three suicides, which happened last month, became symbols of the devastating effects of the economic crisis and forced the center-right government to suspend a few evictions under very narrow conditions. This was a small victory that offered some hope to others facing eviction, such as Irene Gonzalez, a single mother with three children. By coming to a neighborhood association, she discovered a new sense of solidarity and was able to overcome a feeling of shame. But facing the bank was not easy. "When I found myself going to the bank to beg them to pardon my unpaid mortgage payments, I couldn't afford feeling embarrassed," pausing as her voice cracks. "I cannot feed my children with embarrassment." And it's precisely food that more and more newly poor Spaniards desperately need. The jobless rate is spiking above 26 percent — Europe's highest. One-third of the unemployed are completely outside the social safety net, and the cushion of grandparents' pensions is rapidly being devoured by new taxes. At the Madrid food bank, a huge warehouse on the outskirts of the capital, dozens of trucks from various NGOs are being filled with foodstuffs — from rice, lentils and milk to fresh fruit and vegetables. Everyone at this nonprofit is a volunteer, mostly retired professionals and managers. Communications director Pilar Saura says the food bank is able to provide for 70,000 people, which represents only 20 percent of the actual need in Madrid, despite a growing quantity of donations from individual citizens. "All that generosity is impressive, but simultaneously, as the crisis is so big, it is almost impossible to cover all the needs," Saura says. Spain's new citizens groups have each adopted a protest color of their own — white for health workers, green for teachers, orange for social workers. The latest group, judicial employees, chose yellow. Outside the Madrid courthouse, Justice Ministry employees are gathering signatures to protest a new government law. It imposes a tax on every citizen who wants to go to court to challenge a fine or a layoff, to file for divorce or appeal a lower court ruling. Inside the courthouse, Jose Luis Armengol, Madrid's chief investigating magistrate, says the new judicial levy means that justice in Spain is only for those who can afford it. If the government doesn't repeal this violation of the rule of law, he says, the entire judiciary will go on strike. "In an unprecedented action, we've all joined together — judges, prosecutors, lawyers and clerks, from left to right. We feel this incompetent political establishment is trying to dismantle the basic pillars of Spanish society — health, education and justice," Armengol says. Opinion polls show both the government and opposition parties plummeting in popularity, as the gap between government and people widens. Prime Minister Mariano Rajoy is increasingly absent from the political stage. It appears the center-right government is trying to ignore the mounting resistance of Spain's angry middle class.